Tackling some of the weaknesses of the first edition, the second English-language Stradda is a much stronger and appealing publication: the translation is better, and the industry articles are gone in favour of writing that concentrates on artists and aesthetics. 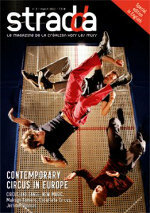 So we have profiles of Maksim Komaro, Jérôme Thomas, and Escarlata Circus, as well as opinion pieces and an extensive feature on circus and dance which addresses some of the various ways the artforms interact by interviewing practitioners as varied as Sidi Larbi Cherkaoui, Jean-Baptiste André and Rudi Skotheim Jensen. Pretty much the whole second half of the magazine is given over to a fascinating dossier on 'new magic' – an emerging artform which is likely to be new territory for artists outside of France and some parts of Scandinavia. There's a contextualising article that follows history back to the roots of magic, profiles of some up and coming practitioners, an interview with new magic spokespersons Raphael Navarro and Clément-Debailleul, and a little catalogue of companies and venues and festivals for those interested in further research. All in all, it's rich and rewarding. Some of the material that makes up the magazine is available online within the Circostrada dossiers, but some of it's not, and it's worth buying anyway to support HorsLesMurs and to support this kind of work, which takes circus seriously as an artform and gives it the attention and depth of thought it deserves.